How to Use ChinaCNCzone Mini CNC Router Machine? How To Use Our Mini CNC Router Machine? Beforer answer above question, let us explain how the mini cnc router machine work? 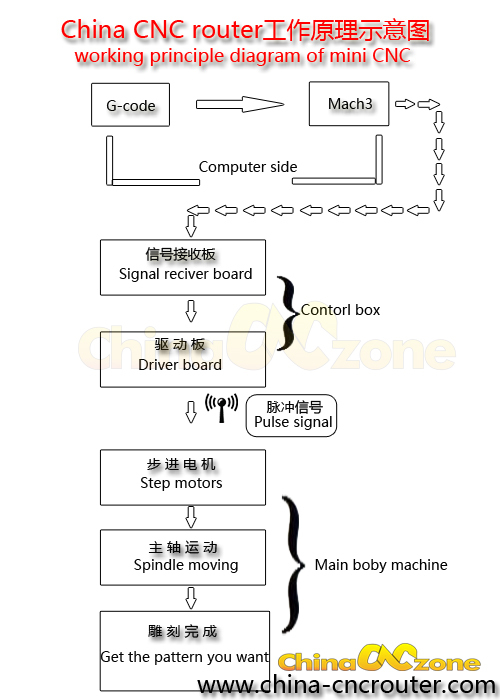 First of all, we should know there is four important elements in signal transmission, signal receiver broad, driver broad, pulse signal and step motors. How the MACH3 transfer operating signal to mini CNC router machine? There is a signal receiver broad in mini router CNC’s controller box, users connect it with computer via parallel port cable or USB adaptor connector. Then the signal transfer from receiver broad to driver broad. Between the driver broads and step motors, the pulse signal plays a decisive significant role in signal transmission. When step motors received the signal, they will move according it to complete the whole engraving. When all setting parameters finished on the basis of G-code, you can get the pattern you want. So about how to use our mini CNC router machine? First, we should design a G-code， this G-code includes all setting parameters of pattern or picture you want to engrave. Second, put the G-Code into MACH3 software, Mach3 will read the G-coed and control mini CNC router machine to complete the whole engraving process. If any more question, please kindly contact ChinaCNCzone team, we are a leading manufacturer for China CNC router. We do not only supply mini cnc engraving machine cnc 6040, CNC 3040 and mini 5 axis cnc machine, but alsoexchange using experience and knowledge of mini CNC routers. Previous: What Will Affect a CNC Engraving Machine Precision? Next: Why Select CNC 6040 Router from ChinaCNCzone?